A central location directly between the more modern city center and the historic area of town makes the Bavaria Pension Marianske Lazne a good hotel in Marianske Lazne for many types of visitors. 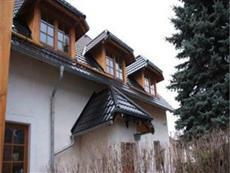 It is close to the local forest tracks and trails, but is also within walking distance of the railway station. The Spa Colonnade, Ferdinand's Spring, Singing Fountain, and Caroline's Spring are all just a few minutes from the property too. Golf enthusiasts can enjoy the city’s popular course, and the casino is also just a short commute from the hotel as well. The Bavaria Pension Marianske Lazne is located at Palackeho 61 which is approximately 19 miles from the Karlovy Vary International Airport. All of the guest bedrooms in the Bavaria Pension Marianske Lazne are of the standard “hostel” variety and will come furnished with TV service, direct dial phone service, high-speed Internet access, and a large private bathroom. Guests of the Bavaria Pension Marianske Lazne will greatly appreciate the fine facilities and services, including 24-hour front desk service, free daily breakfast service, laundry facilities, a bicycle hire desk, a games room, and an in-house restaurant.